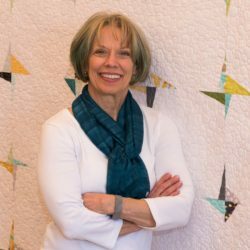 Using a scrap of fabric as a “starter,” learn how to create a unique free-motion-quilted mini quilt, step-by-step. A timid free-motion quilter will gain confidence and students with a little free-motion experience will learn how to combine motifs and discover their own personal style. We will cover a variety of styles and motifs in class and students will build an inventory of motifs that will be useful in their quilts. Optional Materials/Kit Fee: $12 if don’t want to make/bring your own quilt sandwiches: $12 is for for (2) 18” square quilt sandwiches and starter square. Must let Jenny know in advance if want to purchase. Jenny will reach out to all students one month prior to class. Two 18” quilt sandwiches of quality 100% cotton fabric and quality batting. Fabric should be a lighter colored solid- could be white, a lighter value of any color, beige, light taupe, etc. Baste quilt sandwiches together using your preferred method. A fat quarter (or larger) of a large-scale print to use as your “starter”. See note below. I will bring some starter squares to share just in case. Several colors in the medium range plus one lighter color of quality thread to compliment your starter’s colors. The lighter color should show lightly on your sandwiches. Marker of choice-blue wash out, Sewline, chalk, anything that marks well. 24” quilter’s ruler-only needed once so students could share with a friend. Pencil and 15 sheets of blank paper or a notepad. Motifs need to be simple enough to easily stitch around. Something with lots of nooks and crannies would be difficult. You want to like the fabric-something that interests you. It works best if the motifs are varied, mainly stand alone, not all connected and intertwined. Scale is important: motifs bigger than your closed fist may be too big and motifs smaller than a silver dollar could be too fussy. Bring threads to compliment your chosen fabric. In general, error on the side of lighter than darker. Darker threads can look “spider web-ish” and also will show less-than-perfect stitching more easily.